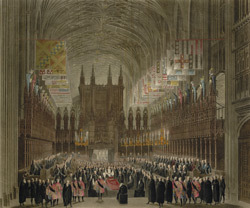 View of the funeral ceremony of Princess Charlotte, the daughter of George IV, who had died in child birth in 1817. Many members of the Royal Family were buried in the chapel. As can be seen from the print, it had an exceptionally elaborate interior. The Chapel, which was built between 1477 and 1528 was built in spectacular Gothic Perpendicular style. The flat vaulting in the choir of St George's is supremely ambitious and shows the complex engineering achieved by late medieval masons.